We also carry the NEW Alfred StagePlayer Stand & Stool. Nick Vail's - The StagePlayer2 Guitar Stand and Stool is revolutionary. 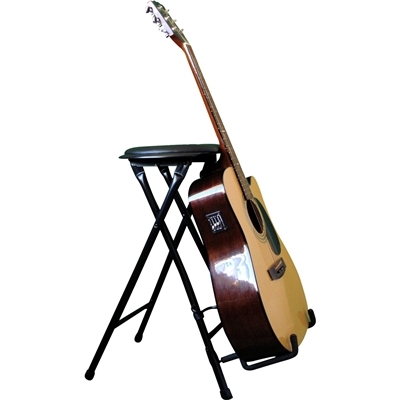 This durable, folding guitar stand and stool with a fold down foot rest is ideal for the stage, home use, or in-store displays. For the working musician, the StagePlayer2 can serve as a seat during marathon gigs. Between sets, simply put the guitar in the handy, padded cradle for safekeeping. The stool folds down easily in a single motion and locks in place, and then folds back up after you remove the retractable pin under the seat. Lays flat for easy storage when not in use. Guitar not included. *Rugged metal construction holds up to 250 lbs.